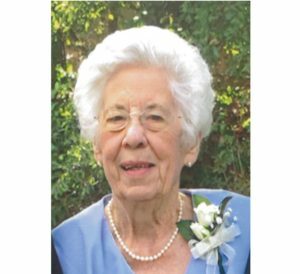 Evelyn Hawkins, 89, of Mauldin, widow of William Douglas Hawkins, went to be with her Lord and Savior Jesus Christ on Tuesday, April 9, 2019. Born in Laurens County, she was a daughter of the late Walter and Beatrice Hellams. Mrs. Hawkins is survived by two sons, Gene Hawkins of Mauldin, and Dean Hawkins and his wife, Jane, of Greer; grandchildren, Briley Vickery (Bryan), Elliott Hawkins (Amanda), Clayton Hawkins, Brooke Cudd (Michael), Blake Hawkins (Kristina), and Blaire McCann (Brent); great-grandchildren, Leighton Cudd, Spencer Cudd, and Preston Vickery; and one sister, Frances Harkins. A Funeral Service will be held on Friday, April 12, 2019 at 2:00 PM at First Baptist Church Mauldin with Pastor Wade Leonard officiating. Interment will follow in Cannon Memorial Park. The family will receive friends starting at 12:30 PM prior to the service. In lieu of flowers, the family requests that memorials be made to: Meals on Wheels, 15 Oregon Street, Greenville, SC 29605. Dean and Gene you have our sympathy in the loss of your mother. Michael, Jr. and Dannis Williams. I am so sorry about mama Hawkin’s. She was a very sweet and special lady. I always enjoyed talking with her. You all are in my prayers.